Time to get you all ready for the craziness of Christmas parties, mulled wine binging, turkey, cakes, germ ridden tubes and the likes. And with that comes a need to pay extra attention to our bodies so when January hits and we all start detoxing, we can keep our body healthy as acting auditions start to pick up. Over the last few years I started paying attention to my very wise friends, and then got reading about a few of life’s simple secrets that help keep us fit and healthy without the need to go into a pharmacy or Wholefoods spending megabucks on multivitamins. See it turns out, some of the simplest solutions to keeping well come straight out of your pantry. Let me introduce you to ‘kitchen cabinet health’! They’re the easiest tried and tested remedies/preventatives and some have been around for centuries. I’m one of those lucky people who rarely get sick. Some might say that mentality in itself is the reason. I do always promote that you are what you speak out aloud and think. But I also find that it’s because I follow a few of these secrets. At the first sign of a sore throat, I’m more likely to do some of the following before heading to my medical cabinet or getting high on Night Nurse. So in no particular order, I would like to share with you a few of my weekly rituals that have kept me more squeaky than a mouse. Also, just to throw a quick disclaimer in here – I am not a medical expert, nor have I been trained in nutrition. These are simply my suggestions based on lots of experience and reading. They work so well for me I can’t help but share them. Dating back centuries this wonderful 20 minute ritual of pulling cold pressed oil through your teeth is absolutely incredible. There are pages upon pages of information about it on the internet from people dedicated to sharing their wealth of experience about what the health benefits are. Simply put, you start your day by taking a tablespoon (perhaps start with a teaspoon as it’s a challenge to do this at the beginning) of cold pressed extra virgin olive oil or coconut oil and swirling it through your teeth for 15-20 minutes. You do this before brushing your teeth, and before eating anything. Not only does it take all of last night’s bad breath out of your mouth, the oil also picks up all of the dirt and germs that have been festering while you sleep. After you’ve hit your twenty minutes of swishing you simply spit out the oil and then brush your teeth as usual. Never swallow the oil as it now contains all the impurities that have been removed from your teeth and gums. The result. Pearly white teeth and fresher breath. It’s also been linked to a reduction in gingivitis and other nasty mouth ailments. One tip: Organic cold pressed extra virgin coconut oil is personally by far the nicest tasting to use for oil pulling. You can buy it from Tescos for as little as £5-6 for a jar that will last you months. The picture is the one I buy from Tescos and it is awesome! Oh I love this one. Who would have guessed that bicarb of soda doesn’t just getused for baking. It also happens to do lots of magic to our internal organs. When you’re feeling poorly, run down or feel the onset of a potential cold, simply take a teaspoon of bicarb of soda and put it in a glass of water. The taste can seem a bit gritty but it doesn’t take long to get used to. Effectively what it does is reduces the acidity levels in your stomach to help the body return to it’s right alkaline levels, in effect warding off the bad bugs. But it doesn’t stop there. Bicarb of soda is a ridiculous product because it does so many things. A small amount of bicarb of soda mixed with your toothpaste helps keep your teeth whiter and brighter. Also just half a teaspoon mixed with the shampoo and thickened into a paste becomes my shampoo for the day once every few weeks. It’s incredible because it gets all of the oil build up off your hair follicles leaving it feeling baby soft. Because I dye my hair (damn those greys!) I don’t like to do this too much as I’m not certain if it’s going to strip the colour. But it’s been working a treat doing it every once in a while. Oh these magical Kiwi bees have a lot to answer for. Where do they get their superpowers? Out of all the little tricks I’ve learned about my body, I think manuka honey is the most important. When I feel poorly if I have a teaspoon of this honey I don’t get sick. Now I hate honey and maple syrup….literally despise them, but I have learned just to swallow the teaspoon-full straight away and follow it swiftly with something savoury to mask the taste. But if you’re unlike me you might find it a total treat to get to have a tasty teaspoon of it every other day. Or you can simply put that teaspoon in your cup of tea instead of sugar once a day. Manuka is the one product off this list that is best bought from somewhere other than your local supermarket. I’ve tried a few from there and found the quality was massively compromised. If you talk to a person at Wholefoods or your local health food store they will recommend the plus rating you should get. Make sure it’s at least 10+ so you get the benefits, but you may not need anything as high as 20+. Getting advice is always useful. But wait there’s more. Manuka honey also doubles as a face mask. Crazy right. I had one bottle that I bought from a supermarket once and within a month or two the honey was very crystallised. It was just poorly produced. So instead of wasting it, my nutritionist friend suggested I use it as a face mask weekly. The result – beautiful soft skin after leaving the honey on my face as a thick spread for 20-30 mins and then washing off with warm water. And you don’t even have to worry if you accidentally lick any. I don’t know of many detox books which would leave this little trick out of their introduction. If you wake and have a cup of warm water with freshly squeezed lemon twenty minutes before breakfast you do all kinds of wonderful to your stomach. The lemon aids in getting the juices flowing in your body so it’s better able to breakdown food. It’s been linked to helping with weight loss, cleansing your body of impurities and also boosting your immense system. Hey presto, here’s a more detailed breakdown of the health benefits. 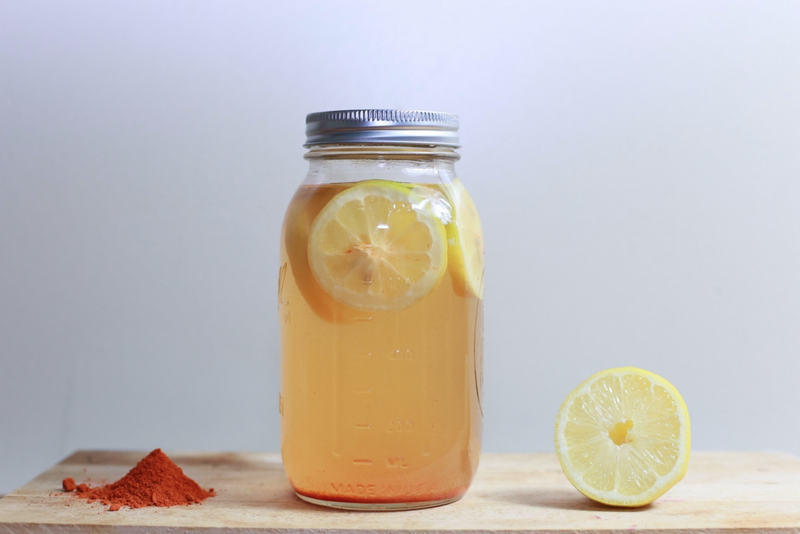 Alternatively you could opt for lemon and ginger tea: it’s a simple one but it is effortlessly easy to make and you can’t OD on this good stuff. If you like herbal teas why not have this with nice chunky pieces of ginger in the bottom, which you can even eat later. In fact certain types of people can actually benefit from having a warm lemon drink at the end of the day rather than the beginning. I met with a lady who works on all things stomach related and she advised me that I’m actually best having warm lemon water right before bed so my body sings first thing in the morning. So far it is working a treat. Who would have known. These little boosters are one superfood must have. They have so many benefits (just likequinoa does!!) and are full of calcium, magnesium – something women often crave during periods that leaves us reaching for a chocolate bar – and healthy omega 3 fats. 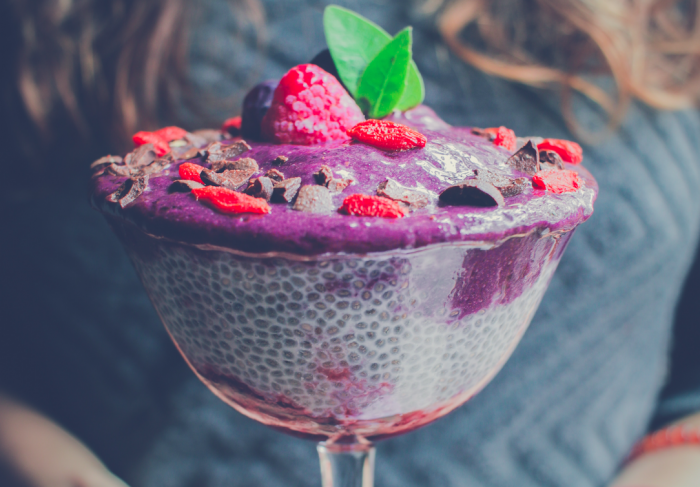 My favourite thing about chia seeds is they are so easy to add to dishes but you will barely notice they’re there. You can pop them in your muesli, your muffins, your cereal, porridge, soups, smoothies and salads and you wouldn’t even notice them. Plus they come in both white and black so you can even colour co-ordinate your seeds according to the dish….I know I know….but some people like to do that. I won’t delve into too many reasons why as it’s covered here in lots of detail, complete with some delicious recipes on how to enjoy them in your daily diet. Oh and of note is that chia seeds don’t cost an arm and a leg, but do make sure you get good quality white or black ones. So there we go. My five favourite pantry treats that are el-natural and so good for you. I would love to know if you do any of these already and if you’ve noticed a difference. Or if you have some other little secrets that I should know about. I am so excited about what other surprises my pantry may have in store for me. Yours in honey, lemon and all things edible. * Originally this article appeared on 30ish.me as I was a regular contributor. As they are no longer up, I really wanted to share this as it’s so important for people to try and keep healthy the natural way. To see more about how to be healthy, and also gluten free options for a way off life, check out the Gluten Free actor page. Making your own tea from onion leaves sounds absolutely amazing! Definitely going to try that if I come down with a cold!